At first glance it might look like these troops are in the poppy fields of Colombia or possibly Mexico, “fighting” the so-called “war on drugs.” After all, the U.S. government has dedicated five billion dollars to Plan Colombia since 2000 and more recently another 1.4 billion dollars to the Meridia Project, all with the goal of defeating the illicit traffic in opium and heroin. And according to the DEA it has been effective, forcing a 44% increase in the street price of a gram of cocaine, as well as a 15% reduction in its purity. Indeed, it almost seems like it is worth the effort … almost, but not quite, since there doesn’t seem to be much evidence of a reduction in demand, which means the drug dealers are just getting richer. But in any case, I digress, for the photograph is not of a battle field in the war on drugs, but actually a battle field in the war on terror! There might actually be some sense to focusing on the drug trade in Afghanistan given the evidence that there is a connection between the illicit traffic in opium and various insurgent groups, including both the Taliban and Al Qaeda. But, of course, the approach is all wrong. For one thing, the U.S. government has dedicated the majority of its resources to eradication, interdiction, and the prosecution of high-level drug traffickers, strategies which, as we’ve seen in virtually every instance that it has been employed, only makes the drug more valuable. And for another thing, it is stretching an already thin military cohort even thinner as, in the picture above, its efforts are being devoted to an odd form of “search and destroy” fixated on poppies and not the real enemy. But there is a bigger point to be made. As I thought we learned in Vietnam, winning a war such as this requires capturing the “hearts and minds” of local populations, and here those populations—altogether absent from the photograph as if to mark their irrelevance to the basic “shift in strategy”—are the peasant farmers who subsist on their illicit poppy crops. When our policy is to target poor farmers through strategies of eradication and interdiction we not only alienate those who should (or at least could) be our allies in the war on terror, but we push them closer to the enemy with its grassroot ties and increase the likelihood of civil unrest if not actually civil war. And what is sad is that there are more effective approaches, such as those used to undermine the international drug traffic coming out of India and Turkey, including licensing farmers to produce crops to be used for legal pain medications and/or buying crops from the farmers and then destroying them. But apparently John Walters, America’s drug czar, and the Department of State will hear none of it. After all, this is a war on terror. Either you are with us or you are against us. Why use the carrot when you can use a stick—even if it doesn’t work! Great piece, and it’s dead on the money. You pretty much have to depend on the blogs for this type of truth and insight – the traditional media is terrified of the powers that be. Yes, I agree. We’re not going to be making any friends from Afghans by destroying their crops. We must address the reason for demand, not the “problem” of supply. There are over 600 square miles in Afghanistan given over to growing poppies that last year produced 7,700 tons of opium. Production has soared to such an extent in recent years that supply is outstripping demand. 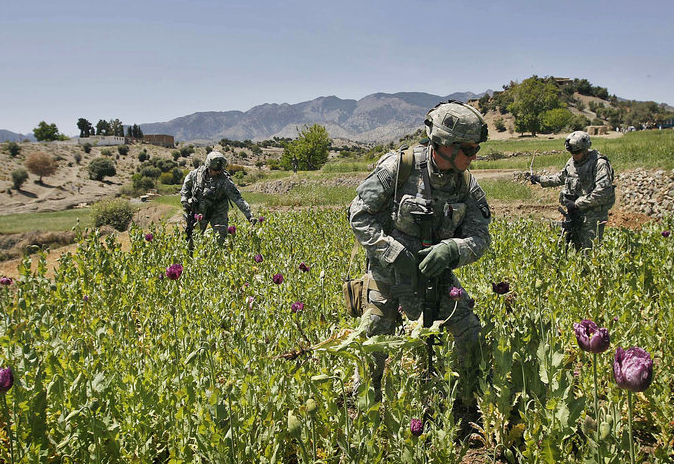 If the soldiers in the picture are destroying opium poppies while on patrol, they’re doing a lousy job of it. Seems to me they’re in the business of protecting rather than destroying. Opium production has increased 80% since the US invaded with Afghanistan now supplying 90% of the world’s supply of heroin. From the reports I’ve read, the only eradicating our forces seem to be successful at is on the civilian population. I’d call it either a “War Against Humanity” or a “War For Drugs”.